Polar Ice™ delivers the benefits of cryotherapy with compression for soft tissue trauma. By reducing pain and controlling edema or swelling, cold therapy allows faster return of normal function. Encapsulated ice packs filled with purified water are encased in soft fleece material that eliminates migration of ice wrap during use. Easily adjusted with hook and loop closure straps, fleece wrap conforms to body and insulates skin to prevent frost bite. Use post-surgically, during rehabilitation and following physical activity. 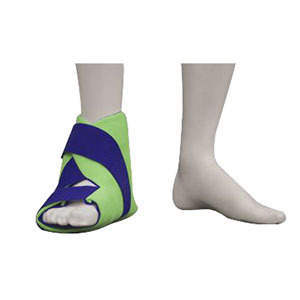 Effective to provide pain relief for bruises, sprains or injuries requiring cold therapy. Soft fleece covering to protect skin. Eliminates migration of ice wrap during use. Insulates skin to prevent frost bite. Use for post-op cryotherapy, sports injuries, rehabilitation, soft tissue trauma, edema and swelling.